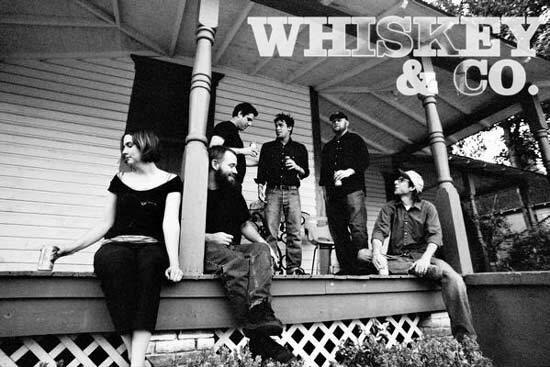 While not your standard fair style-wise for a No Idea artist, the punk community has embraced Whiskey and Company's country musings. Vocalist Kim Helm spoke in depth with Scene Point Blank about the lyrical inspiration for the band as well as what we can expect from the band in the coming months. Scene Point Blank: First off, introduce yourself. Kim Helm: What do you want to know? I'm, Kim, I'm a psychiatric social worker. Oh, and I also sing for Whiskey and Company. Scene Point Blank: You obviously have strong ties with the punk community even though your music doesn't really fit the genre. When you started, did you get a lot of vacant stares or were the crowds pretty supportive? Kim Helm: Well, when we started playing shows they were mostly in Gainesville at our friends' houses or at shows that our friends set up for us, so playing to a roomful of friends we didn't get too many ?vacant stares.' As we started playing shows out of town, I definitely noticed some folks not really getting what we were doing or why we were playing with Against Me! or Hot Water Music or other Gainesville bands. Nevertheless, it seemed like, even then, someone would always approach us afterwards to let us know she or he did not expect to hear something like that at the show, and how pleasantly surprising it was. Scene Point Blank: Do you think your boozy lyrics help the response? If you were just singing songs about heartbreak, would punks react the same way? Kim Helm: That's a good question. I think when we started, it certainly added to our energy and that of the crowd and it still does, but not all punks are drunks, are they? 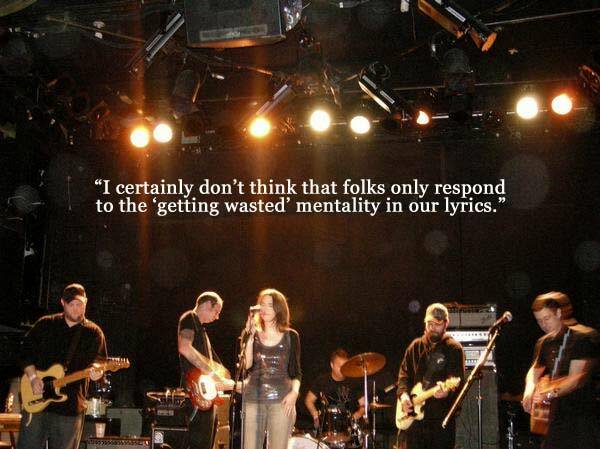 I certainly don't think that folks only respond to the ?getting wasted' mentality in our lyrics. Everyone can react or empathize with a story about getting your heart broken and using self-destructive means to deal with it. So, I guess some people do only connect to the drunken part of the song, but it would be a shame if that were where it ends. Scene Point Blank: Over half of your songs (at least) are about getting drunk or high. Was it a group decision to take the band in this direction, or did it just happen this way? Kim Helm: We definitely didn't sit down and say, "Hey let's only write about drugs or booze," but we've all been at the bottom of a bottle a time or two for whatever reason- in good times and bad, so when we write lyrics that inevitably makes its way in there. Not to say that every song is about "getting high and drunk." Even a song like, "High Tonight" isn't solely about getting wasted. It's about being so depressed and not caring so much that you might as well try to kill yourself by getting as wasted as you can on whatever you can find. To me, it's a really depressing song, and we've had friends who were at that point. I'm sure lots of other people have too. So, while everyone responds to it as this anthem of ?let's get fucked up,' that's not the end of the story. Scene Point Blank: Do you consider your songs to be personal, or more of a storytelling variety? Kim Helm: I think they're a little bit of both. I did not write all the songs, so I cannot speak for the guys, but I know that my songs are very personal and usually from my own experience, but I also have written about a story I might have heard from someone else or read somewhere. I take that story and weave a song around it. Scene Point Blank: You occasionally alternate singers. How do you decide when to do this? Kim Helm: Good question, again. It usually just evolves into that. I know with "Never Said Nothing" we wrote the song with that idea in mind. For a song like "Happy Hour" it made sense to alternate because it's more of a sing-a-long song and that's how Brian saw it when he wrote it. We have a new song that we alternate between Brian and I, and it kind of made sense in that same way. Scene Point Blank: Having a punk background, how is the group dynamic or stage energy different when you're playing country? What about the audiences? Obviously (or hopefully) there's no moshing involved? Kim Helm: Well, I've always been a pretty shy performer, punk band or country band, but I think we bring the same energy either way. We're having a good time up there playing and we want everyone else to have a good time too. I think it's certainly more mellow when we're playing country, but the other day one of my co-workers said, "You guys are as traditional country as anyone out there, but with an aggressiveness that's missing from traditional bands." Not sure if that explains anything, but I thought that was a good take on it. As far as the audience, I've definitely seen some craziness from the stage?but with a lot more partner dancing than I ever saw at a punk show. Scene Point Blank: Do you play many shows outside of the punk community? Do you see a difference from your perspective onstage? Kim Helm: In Gainesville, when we set up shows we tend to just play with our friends no matter what kind of music they're playing. There is definitely a difference between when we set up a show with bands playing similar country style music than when we play with a thrash or punk band. When we toured with Lucero, I didn't really see that as a punk show and some nights it felt like a frat party and other nights it felt like a punk rock house show. It really all depends on who shows up. Scene Point Blank: You played with Lucero last year. Have you done any other national tours? Kim Helm: Going on tour with them was a dream come true and we really had such a great time with those guys. We have not done a national tour since then and that was our first one. We are currently working on a new record and hope to plan a big tour once that is recorded and out. Scene Point Blank: Do you have plans to do your own touring soon? Kim Helm: We are definitely going to tour once the record is done and out, and we will most likely do some mini-regional tours in the time between it being recorded and actually coming out. We're trying to set up some Florida/Georgia dates right now. Scene Point Blank: Moving on, I have a few Fest questions. I'm pretty excited to be back down there, myself. You're from Gainesville, right? How does the city change at Fest-time? Kim Helm: Not technically from Gainesville, but I've been here fourteen years on and off, so I feel like it's home. The town has a totally different energy during The Fest. I'm not sure if everyone else feels it, but I know I do. I start getting really excited knowing all these friends from out of town will be here along with so many others, and I'll get to discover new bands while at the same time see my friends play to all these new people. It feels like one big family, really?one big family who likes to go to really good shows together and drink copious amounts of beer. Scene Point Blank: What should Gainesville visitors make sure they do while they're in town? Kim Helm: Well, if it wasn't cold, I'd say everyone needs to experience one of the many springs around Gainesville (Itchtucnee, Blue, Poe) but since it's a little cool to swim in water that cold, everyone should try to bike/walk/drive down to the La Chua trail, which is part of Paynes Prairie and hike. It runs along a big sinkhole filled with alligators and I always try to take out of town friends there, especially if they've never seen an alligator. Other than that, happy hour on the Porch at Common Grounds is a must, eating ice cream or vegan sorbet at Sweet Dreams is always tasty, and definitely, most importantly, find an after hours house party to attend. Those are always the best part of The Fest. Scene Point Blank: How many Fests have you played? Kim Helm: I'm pretty sure we've played six, including this year which I guess, technically, we haven't played yet. All of them, except last year when we were on the road with Lucero. Scene Point Blank: What's your most memorable Fest experience? Kim Helm: I think some of my favorite memories are from playing outside at the future house and various venues at the BBQ during the day on Saturday. Everyone was a little haggard from the night before, but still totally into it. As I said above, the after party experience is always a great one and my favorite was one at the old Whiskey house where there were so many people it felt like the porch was going to break away from the house. It was awesome looking around at all these people from out of town hanging out with us at that house. Scene Point Blank: Do you think that having Fest at Election time will affect the festivities? Did you play in '04? Kim Helm: I don't think it will necessarily affect the festivities, but I think people are going to be talking about it. I think this election is different than '04. There's a different feeling to the whole thing, so yes, you're going to hear some people talking about it on stage and in the street. Scene Point Blank: Thanks for your time. Do you have any parting words? Kim Helm: Not really. Thanks for the opportunity and thanks for the solid review back when our first record came out. See you at The Fest.